221B Baker Street at Baker Street West is a ‘tip of the deerstalker’ to the greatest consulting detective who ever lived. It takes great effort to convince the world’s preeminent consulting detective and his “Boswell,” Dr. John Watson, to relocate from their natural home in London, England to the California Foothills. But we have persuaded them. Once 221B became habitable in November of 2013, Mr. Holmes and Dr. Watson made the transition to their West Coast domicile. 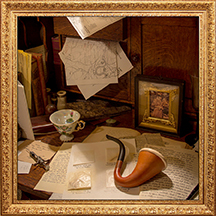 Visitors will observe the intimate objects and extraordinary possessions belonging to this noteworthy pair of remarkable sleuths. Over and above this most excellent opportunity, guests will be thrilled when secret passageways are revealed to them in the course of their tour in 221B Baker Street. ◆Imagine being secretly ushered into the flat by Silas Brown, horse trainer, from The Adventure of Silver Blaze. “Secret” you ask? Well, Mr. Brown has a bone to pick with Mr. Holmes, and he conducts his tours on the sly. ◆Fortunate you would be to see 221B from the viewpoint of Irene Adler, “The Woman,” from the story A Scandal in Bohemia. She is proud to be the object of Mr. Holmes’ admiration, as she is the only woman to “best” Sherlock Holmes. ◆Eliza Barrymore has come all the way from Baskerville Hall of Dartmoor to 221B to retell her part in this sinister story of a supernatural hound, the moor, and mayhem. ◆Miss Burnet, from The Adventure of Wisteria Lodge, will relate on her tour of 221B how she toiled undercover to trap the “Tiger of San Pedro,” a brutal dictator from Central America. ◆Abigail Crosby, a formidable member of the Women’s Suffrage Movement, found herself caught up in some bad business with her former fiancé. The golden pince-nez and the rest of the clues all point to murder! Abigail will tell her side of the story. ◆Mary Maberley is one of Mr. Holmes’ newest clients. 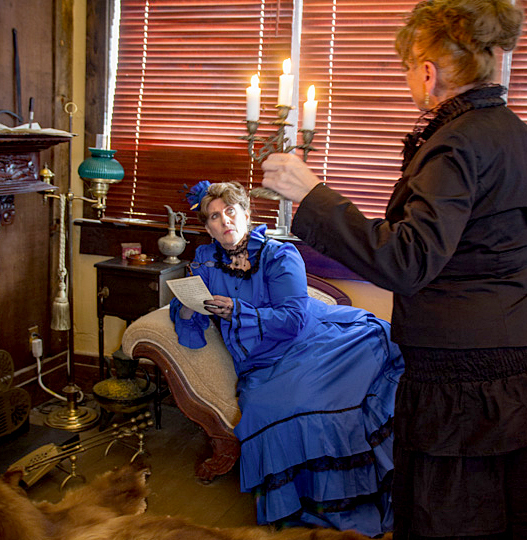 An unknown party has asked to buy her house, The Three Gables, contents, and all of her personal effects. Should she be suspicious? Perhaps you can advise her. ◆Examine 221B with Hilda Adair, who lost her brother by way of a murderous act perpetrated by Colonel Sebastian Moran. 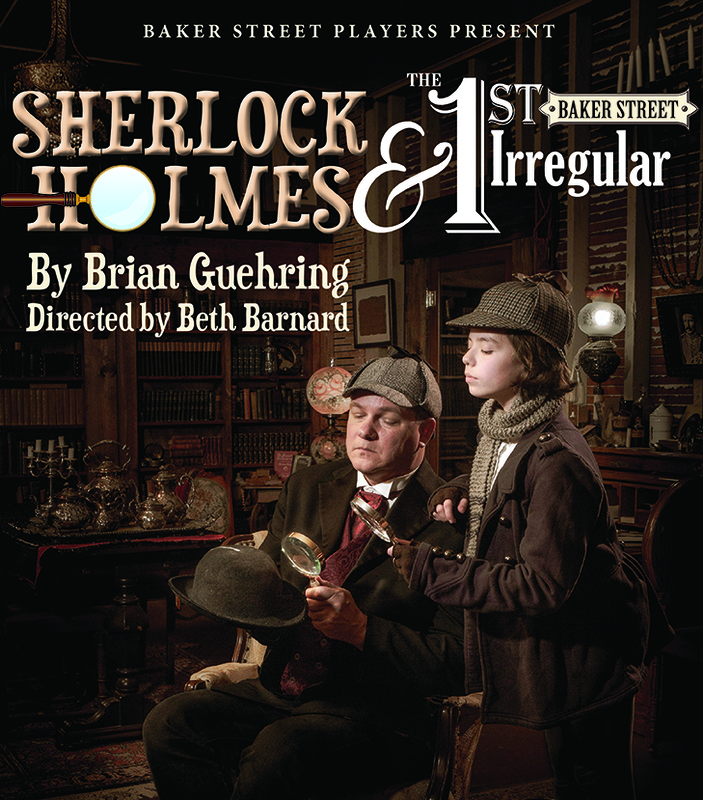 Her tale takes place after The Great Hiatus, when the errant Mr. Holmes returns to Baker Street and to The Adventure of The Empty House. 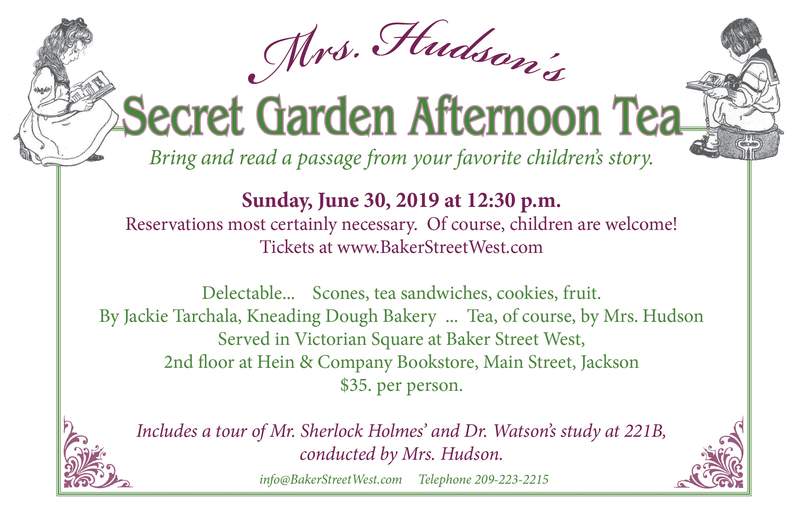 For a private tour by special arrangement, contact Mrs. Hudson at info@bakerstreetwest.com. To be included in a mailing list that announces all events at Baker Street West, do contact Mrs. Hudson at info@bakerstreetwest.com.